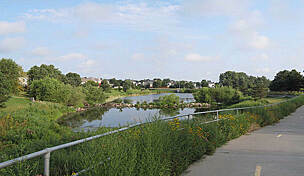 The Blue River Rail Trail in northern Kansas follows the course of its namesake, the Big Blue River, as well as the former right-of-way of Union Pacific Railway’s Beatrice Branch line. 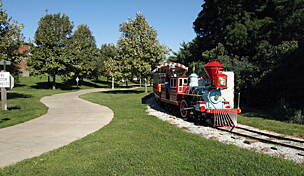 Spanning 9.1 miles, the rail-trail connects Marysville, home to an original Pony Express Station, to Oketo, just south of the Kansas-Nebraska state line. 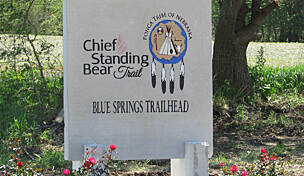 You begin your trail adventure in Marysville where many an explorer has been before you, whether they were traveling on the Oregon Trail, the Mormon Trail, the route of the Pony Express, the St. Joe Road, the Overland Stage, the Military Road, or the Otoe-Missouria Trail. 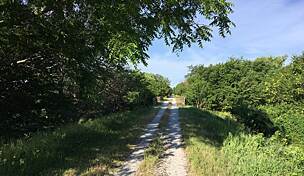 Along with a hefty infusion of history related to the western expansion of the United States, recreationalists on the Blue River Rail Trail (BRRT) will encounter a varied landscape of grasslands, forests, farm fields, river bottoms and towering limestone cliffs. Highlights of the trail include a 20-foot canyon wall, a covered bridge with scenic views of the river, and a restored rail trestle with a steel-grid walkway. 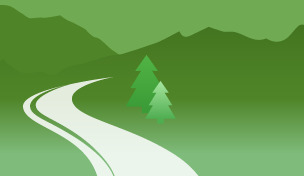 The BRRT will eventually extend 2.8 miles north to the state line and beyond as part of the Homestead Trail extension. You can rent a bicycle from Big Poppi Bicycle Co. in Manhattan, 60 miles south of Marysville and 7.5 miles east of the Manhattan Regional Airport. The BRRT is a rural route – there are no service amenities so pack everything you will need for the ride and consider throwing in binoculars to better spot the abundance of wildlife that live along the trail. There are several choices for lodging in Marysville—Heritage Inn Express, Marysville Surf Motel, and Oak Tree Inn (with its 1950s style Penny’s Diner)—which are all along the Pony Express Highway (U.S. 36) on the eastern edge of town. Before the ride, fill up at Toledo’s Coffee and Deli; they serve coffee and breakfast items, as well as soup, salads and sandwiches. 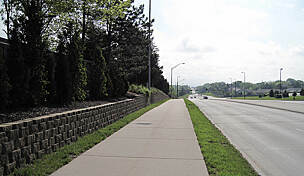 The southern trailhead of the Blue River Rail Trail is off Jayhawk Road, 1.5 miles north of downtown Marysville. The Big Blue River peacefully meanders along the western edge of the trail. You begin by cycling through serene woodlands to a picturesque covered bridge and river bend, Rocky Run. 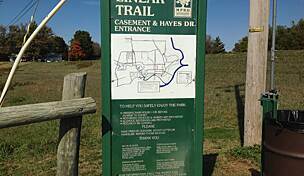 From here, the woods give way to open farm fields and the trail intersects with Harvest Road (mile 2) and Frontier Road (mile 4.9) where there is additional trail parking. Between Harvest and Frontier Roads, the route passes through a canyon with impressive 20-foot limestone cliff walls. A 150-foot bridge takes you over the shallow rapids of Blodgett Creek, a tributary of the Big Blue River. The next 2.3 miles continue through the pastoral landscape of northern Kansas with corn, soybean and alfalfa fields spreading out as far as the eye can see. Shrubs and trees of the river bottom provide some shade on warm, sunny days as well as the perfect riparian habitat for songbirds and small mammals. 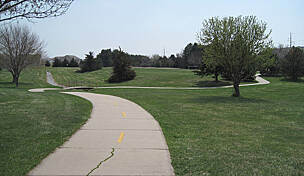 This rail-trail lies on the former rail corridor of Union Pacific Railroad’s Omaha-Kansas City route and the Marysville Subdivision. 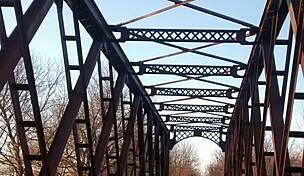 An old railroad bridge with a steel grid walkway carries you over Bommer Creek just before entering the small farming town of Marietta (mile 7.2) From here,Oketo and the current northern trail terminus (at Mill Street) are less than 2 miles away. Although Oketo is a small town, those interested in the area’s history will want to cycle a half mile off the trail to Oketo’s Center Street (go east on Mill Street and north on State Street). With advanced arrangements, you may be able to tour some historical buildings, including Oketo’s old bank, city hall, jail, general store and museum. There isn’t much else here in terms of amenities, so don’t count on stocking up on water and food at this end. Return to Marysville the way you came and explore its small-town shops and eateries on Broadway and Center Streets. There are antique shops, vintage and collectible stores, and restaurants. Since the rail-trail is short, you will have plenty of time to explore Marysville on your second day. The town was established in 1851 as a trading post and ferry terminal and became a major hub of migration and exploration. Even today, Marysville is on one of the busiest railroad lines in the country. A short, disconnected segment of the BRRT actually runs through the heart of Marysville to pass by or near many of the town’s main historical attractions. The trail begins at Broadway and 7th Street, where a Pony Express horse and rider bronze sculpture proudly reminds viewers that Marysville was once a stop along the Pony Express mail service route, which operated from 1860 to 1861. A block east, on 8th Street, stands the Marysville Pony Express Barn, now a museum but once a livery stable leased to the Pony Express. Before you leave the Pony Express Plaza, however, check out the nearby Lifetiles Murals display; two large murals depict a train and a horseback rider, each consisting of 90 individual tiles with images embedded in each tile. Though not on the trail, there are other museums on Broadway worth noting. 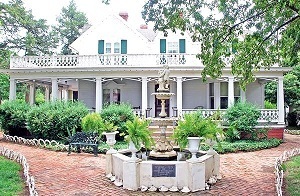 The Koester House Museum and Sculpture Garden is an elegant late-1800s home that displays the prosperous side of life from those days; the cast iron lions and statue guard dogs outside the house were observed by Laura Ingalls Wilder and noted in her diary of 1894. 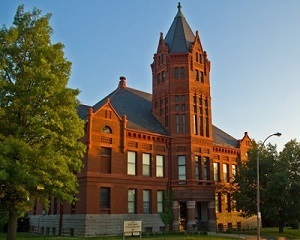 Additionally, the Historic Courthouse Museum and Genealogical Library served as the county’s courthouse for 90 years and now has several rooms displaying a collection of historical artifacts. The BRRT ends at Marysville’s City Park, where there are camping and recreational facilities, as well as historical sites, like the 1901 Union Pacific depot, a sod house, a rural schoolhouse and a steam locomotive. Check with the Marysville Chamber of Commerce to see what activities are taking place during your visit. It might be fun to be around in June during the Pony Express Re-Ride, an annual 10-day ride, between Sacramento, California, and St. Joseph, Missouri, with a stop at the Marysville Pony Express Station. 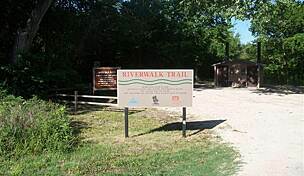 Just south of town, Historic Trails Park commemorates the eight trails which crossed the Big Blue River and the ferry that operated here from 1852 to 1864.